CRA offers a variety of goodies that carry the CRA logo or artwork created to help spread the good news of the gospel for you to wear. 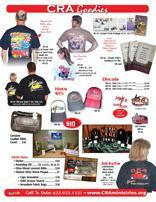 We offer hats, shirts, jackets, ladies shirts, decals, etc for you to select from. As well as our Devotional Book “From Hot Rods to Heaven” written by Dale & Jeannie Daly, and full color Gospel Tract titled “High Performance Hot Rods & Horse Power”. Please read below to see more information regarding these great offers. You will find a link to our printer ready order form. All you need to do is to fill out the quantity of each item that you want, tabulate the prices, add the shipping for each and mail it in with your check, money order or credit card information to the address on the form. Jeannie is honored to share her personal experience of God's supernatural healing in this booklet. Her heart in sharing her story, is to encourage your faith to 'believe'! This is a 'must have' booklet, that can change your life forever...bringing the personal healing you need to your life. Call the office today at 623.925.1121 to get your copy...and don't forget to get extras for your friends and family members. A 52 week devotional book that will be sure to inspire and encourage you in your Christian walk. This is an awesome automotive but yet Christian themed devotional book that makes a perfect gift for a friend or a great daily ‘driver’ reader for you! Written by CRA President/Pastor Dale Daly with Jeannie Daly, you will thoroughly enjoy this book. In the world of hot rods and custom cars, there is a guy who is truly a Goodguy to all the guys and gals who build hot rods, own hot rods and drive hot rods. His name is Dale Daly. Dale has been closely associated with the Goodguys Rod and Custom Association for many years and thousands of car guys and gals look to Dale, his lovely wife Jeannie, and Christian Rodders & Racers Association for guidance in their everyday lives. I’m sure you’ll rejoice in reading the “Good Words” from Dale in this book. ENJOY!!! The vintage steel of a street rod has stood the test of time. It is not a fiberglass reproduction or new steel look-alike. It’s from the ‘original production’ run. If it could speak, it would tell of experiences of the past. Pastor Dale uniquely takes the vintage steel of God’s word and combines it with the experiences of days past to speak to us in the world we live in today. Listen closely and let the ‘Vintage Steel of God’s Word’ change your life! These full color – very professionally produced tracts are being used by churches, businesses (by including them in their orders being shipped as well as their billings). They are also being used to put in ‘Goodie Bags’ for their local motorsport events as well as individuals using them as an open door to share the “Good News of the Gospel” in a non-threatening fashion. Whatever the case, this is the perfect item to always have with you for ‘that moment’. The tract includes testimonies from Paul Le Mat…aka John Milner in American Graffiti; Jim Murphy…Driver of the OSH/WW2, 4-time World Champion Nostalgia Top Fuel and Gary Heidt…owner of HEIDT’S Hotrod Shop. Now you can get both CRA brochures to hand out to your friends and at motorsport events you attend. These black & white brochures will help you when you are explaining to your friends and those you come in contact with, who CRA is and what we are all about. These brochures are available for a donation of $5 for a package of 25 (plus shipping-see order form). CRA offers a variety of goodies that carry the CRA logo or artwork created to help spread the good news of the gospel for you to wear. We offer a wide selection of hats, tee shirts, polo shirts, shop shirts, jackets, ladies shirts, kids shirts, sweatshirts, license plates, decals, patches, etc for you to select from. Our CRA apparel comes in a wide variety of sizes to accommodate even those larger 4X size needs. We have a large selection of ladies shirts with a special heart shaped CRA logo embroidered on it for all you gals. We also have a ‘bling’ shirt for you ladies who like the glitter and glitz. We carry both silk screened and embroidered apparel to help complete your outfit with a professional look. Click on the link to our printer ready order form. All you need to do is to fill out the quantity of each item that you want, tabulate the prices, add the shipping for each and mail it in with your check, money order or credit card information to the address on the form.